Denny May poses beside a cutout of his dad, Wop May. The younger May will help the museum mark Blatchford Field's 90th anniversary this month. Blatchford Field might not have come to be if not for the efforts of legendary bush pilot, Wilfred "Wop" May. "My dad was flying out of Mayfield, about a mile west of here as early as 1919," says May's son Denny, the official keeper of the family history since his father's death in 1952. By 1924 the elder May decided the old field was too small. "He talked to the mayor, Ken Blatchford, and said 'Could we get this Hagman Farm and convert that into an airport. It would be really handy. It's along Portage Avenue (now Kingsway) which is a nice road.' Ken Blatchford and my dad pushed the thing through city council and it became Blatchford field." The field opened for flying in 1927, but it would take a momentous event almost two years later for the airfield to prove its worth. "My dad got a call from Dr. Bow, the provincial deputy minister of health, saying 'We need diphtheria antitoxin flown up to Fort Vermillion,' " says May. 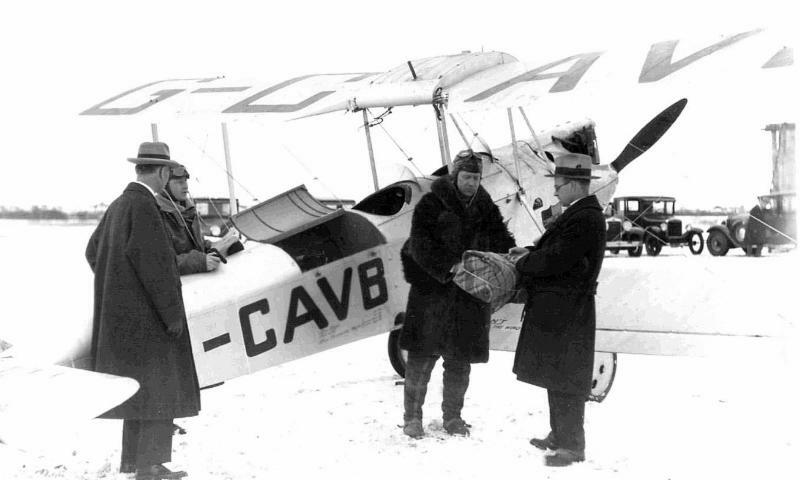 "My dad and a new pilot, Vic Horner, got in their (open cockpit) Avro Avion on January 2, 1929, and headed down to Peace River. It became a nation-wide and a North America-wide phenomenon. They sent a photographer here from New York to cover the story. They got the serum to Fort Vermillion. There were 10,000 people here to greet them at the airport when they landed." After that, Edmonton City Council approved money to improve the airport and Edmonton went on to become the aviation gateway to the North. May went on to establish Commercial Airways, flying all over northern Alberta, Saskatchewan and British Columbia. When World War II started, he turned his attention to helping train Commonwealth air crews. 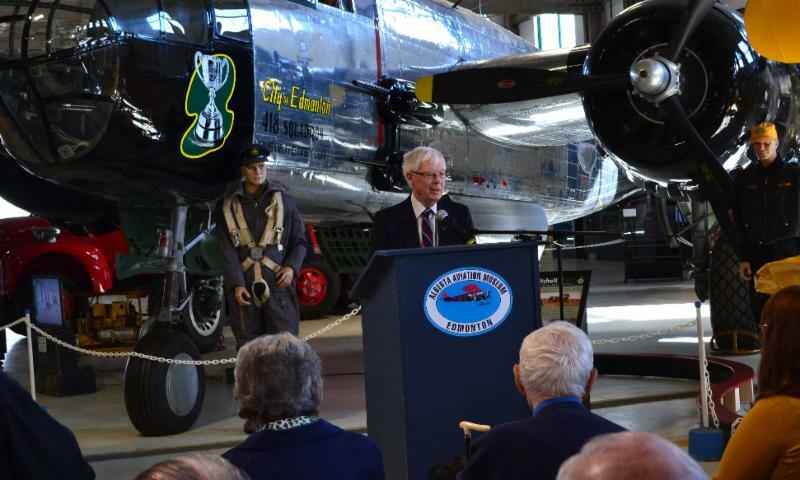 He served as general manager of Number 2 Air Observers School (AOS), based at Blatchford in the very hangar that is now home to the Alberta Aviation Museum. Wop May's son will be the keynote speaker at the museum's Blatchford Field 90th Anniversary celebration, June 24 from 10 am to 4 pm. The event will have many family-friendly activities including a chance for children to have their pictures taken dressed up as bush pilots and fighter pilots. Visitors also will get access to the cockpits of airplanes normally closed to the public. We'll also be staging a re-enactment of the opening of Blatchford Field. This is an event you won't want to miss. Keep your eyes on our web site and Facebook for more exciting details. The storied history of Edmonton’s 418 Squadron was on display last Tuesday as the history gallery detailing the unit’s achievements reopened after a year of renovations. 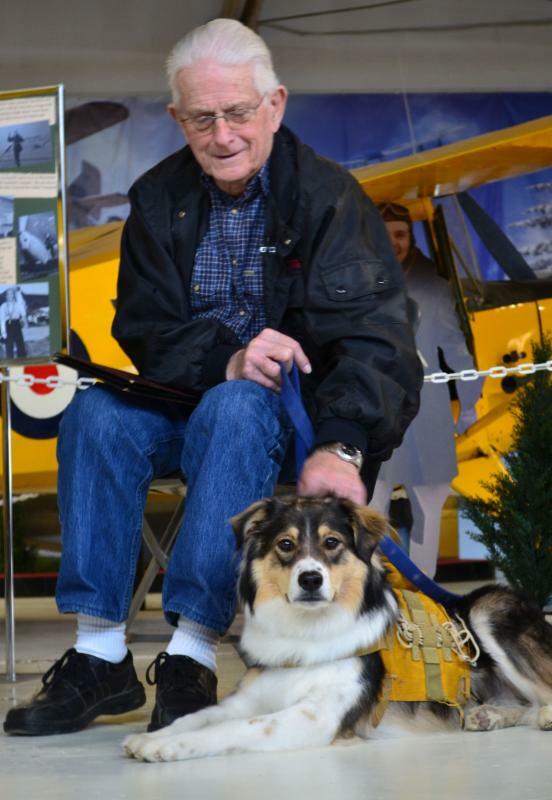 But the star of the event was a dog, a parachute and a former squadron mechanic. 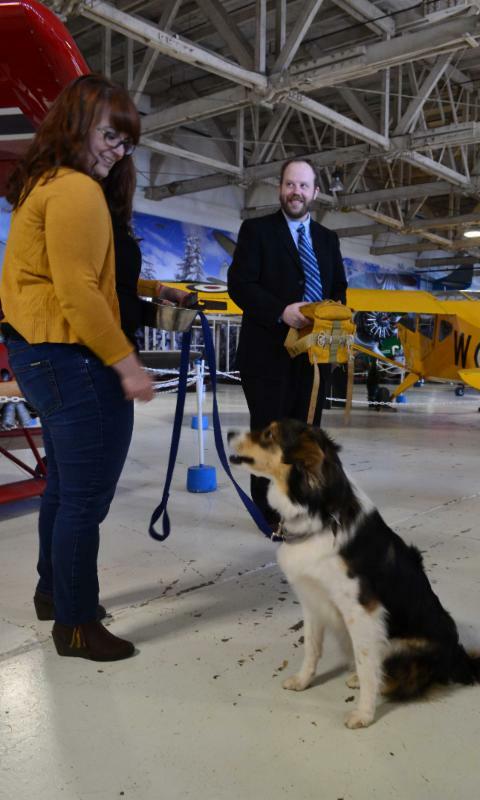 In the mid-1950s, 418 Squadron Corporal Al Colby found an stray dog behind their hangar, now home to the Alberta Aviation Museum. Butch, as the squadron named him, became their mascot and traveled everywhere with them. He even had his own parachute, the only mascot in the RCAF with his own flight gear. The parachute was rediscovered in a Calgary attic and returned to the museum in 2014. When Linus, a stand-in for Butch, modeled the parachute at the opening ceremony, Colby and the dog became instant media stars. They appeared on all local TV newscasts and their picture even graced the front page of the Edmonton Journal. Laura Patterson, Linus’ owner was also delighted with the way her pup handled the notoriety. Linus is just over a year old and, like Butch before him, was also a rescue. Patterson adopted him last summer from Second Chance Animal Rescue (SCARS.) The group helped the museum connect with Linus’ owner for the event. Our thanks to Laura Patterson, Al Colby and SCARS for helping make the gallery reopening a huge success. Be sure to drop by and see for yourself how the gallery tells this important part of Edmonton’s aviation history. You can find out more about 418 Squadron history here, and for more about Linus and SCARS here. Laura Patterson, owner of Linus, and 418 Archivist Ryan Lee, prepare to put the parachute on Butch's stand-in. Terry Champion, former 418 Squadron pilot, speaking at the history gallery reopening. Watch the CTV Edmonton story. View the CBC Edmonton story. See the Edmonton Journal coverage. June 24, 10 am to 4 pm. 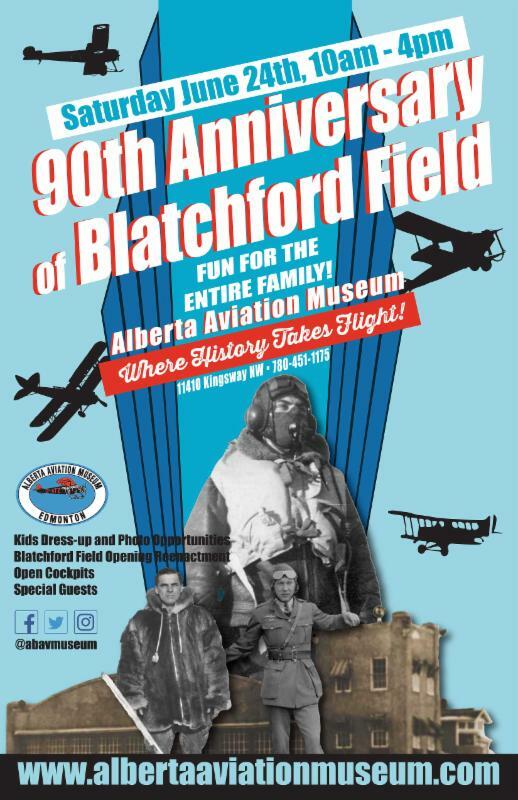 90th Anniversary of Blatchford Field. 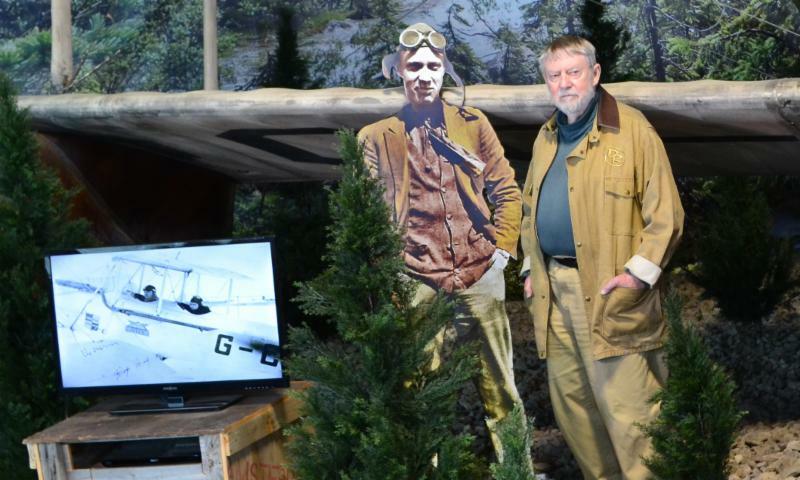 Dress up as a bush pilot or fighter pilot, re-enactments, open cockpits, special exhibits and more. Ceremony at 1pm. More details here. .